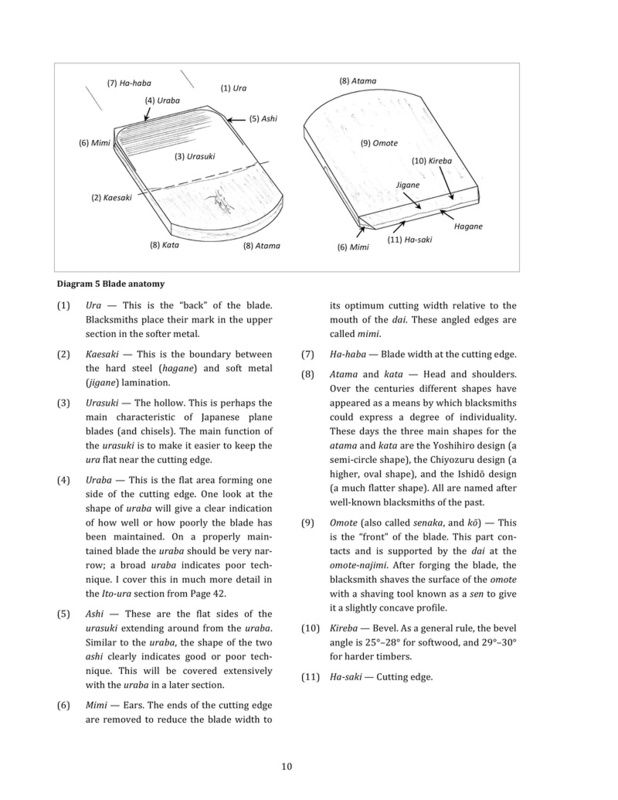 Smoothing planes (hira-ganna) are the workhorse of Japanese woodworking. 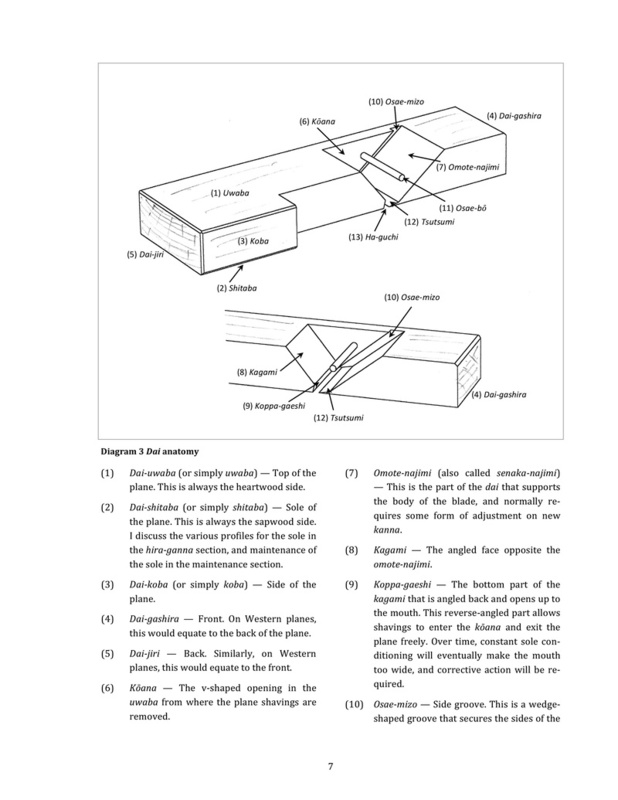 Although they seem to be a fairly uncomplicated design - a blade and a chip-breaker held securely in place within a wooden block called a dai - they really are a very complex integration of angles, grooves and wedges. Apart from some modern planes that use HSS, blades are laminated with a thin piece of hard steel (hagane 鋼), which forms the cutting edge, and a thicker backing of softer metal (jigane 地金). These blades are hand-forged, so there will always be subtle differences between blades. The dai is therefore made to fit the blade, and a quality combination of the two requires great skill by the blacksmith and the dai maker. The five planes in the photo above are my main hira-ganna. Each one has a different use, so the set-up (sole, and blade camber) is slightly different for each. The three on the left are my finishing and semi-finishing planes (for thinner pieces such as rails and stiles), and finishing plane for wider panels. The fourth is a slightly smaller plane for somewhat rougher work. 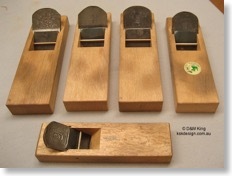 The fifth plane in the front is for getting into tighter places, and often for planing chamfers that don't require the chamfer plane. 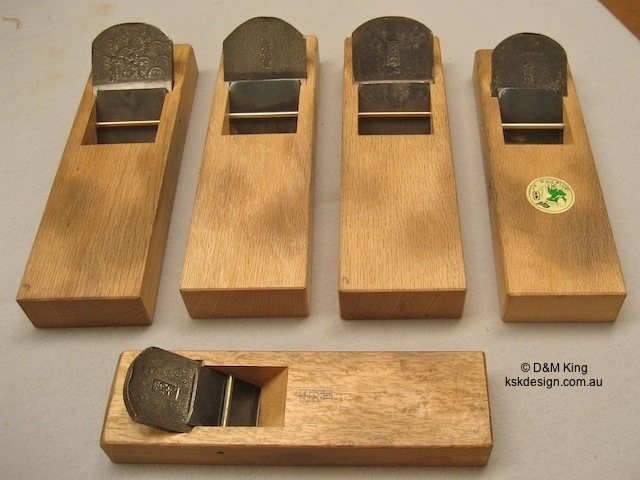 Japanese hand-plane sizes are based on the width of the blade. Probably the most commonly used plane size is 70 mm. The three planes on the left of the photo are 70 mm. The plane on the right is 65 mm, and the smaller plane at the front is 48 mm. 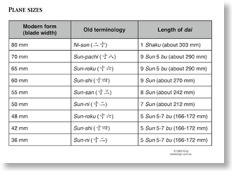 Many woodworkers (and most older woodworkers) in Japan, however, still use the old terminology based on sun and bu for plane sizes. This is the terminology I learnt and that was used at Shokugei Gakuin. These sun and bu sizes bear little resemblance to the actual plane sizes — the 70 mm plane is sunpachi (1 sun 8 bu, which is just over 54 mm). I've read a couple of possible explanations for this apparent anomaly, but nothing definite. ** Eventually I'll discover the reason. The table below lists Japanese plane sizes. In the old style terminology you will notice that the terms are repeated from the 48 mm plane and smaller. This is another one of those "only in Japan" moments, and can be quite confusing, so these days the modern millimetre terms tend to be used for the smaller planes. The dai lengths in the table are only a guide and can vary, especially on the smaller planes. 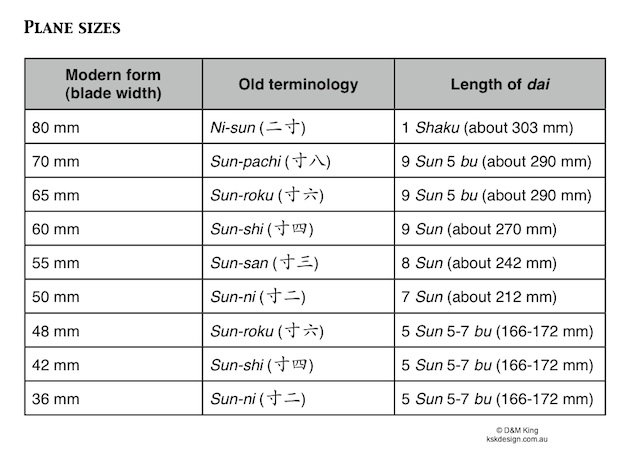 ** The terms for the 48 mm and smaller planes are obviously from the kane-jaku measurements (old unit of measurement used in carpentry and construction, and still used today by carpenters and tategu shokunin) as 1 sun and 6 bu (sun-roku) is just over 48 mm, and 1 sun 4 bu (sun-shi) is just over 42 mm. The measurements for the larger planes are as yet a bit of a mystery. One possible but highly unlikely explanation I've read is that they could be related to the old kujira-jaku unit of measurement used in the clothing industry. In kujira-jaku measurements 2 sun is just under 76 mm, and 1 sun 8 bu is 68 mm; close, but not really close enough. Besides, this unit of measurement apparently was never used in construction, only clothing. (25/6/2011) - I think I've finally stumbled across a feasible answer to the mystery of plane sizes. The sun-pachi (1 sun 8 bu) is 70mm wide (blade width). 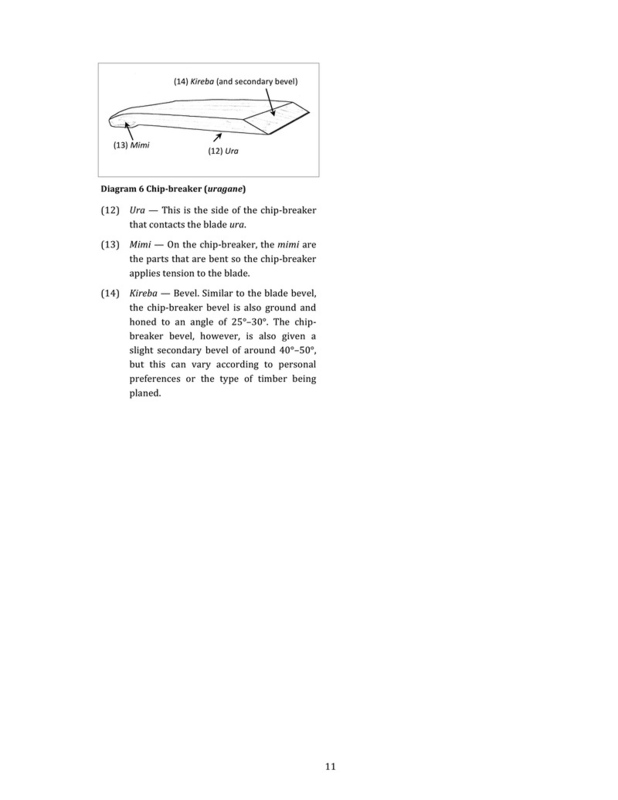 The effective cutting width of the blade is around 2 sun 1 bu (about 63 mm), and it was generally considered that a person who could achieve a consistent plane shaving width of 1 sun 8 bu (54.5 mm) could be regarded as a fully fledged shokunin. I'll stick with this explanation until I find a better one. Detailed explanations of the setting-up and maintenance process are contained in Book 1. 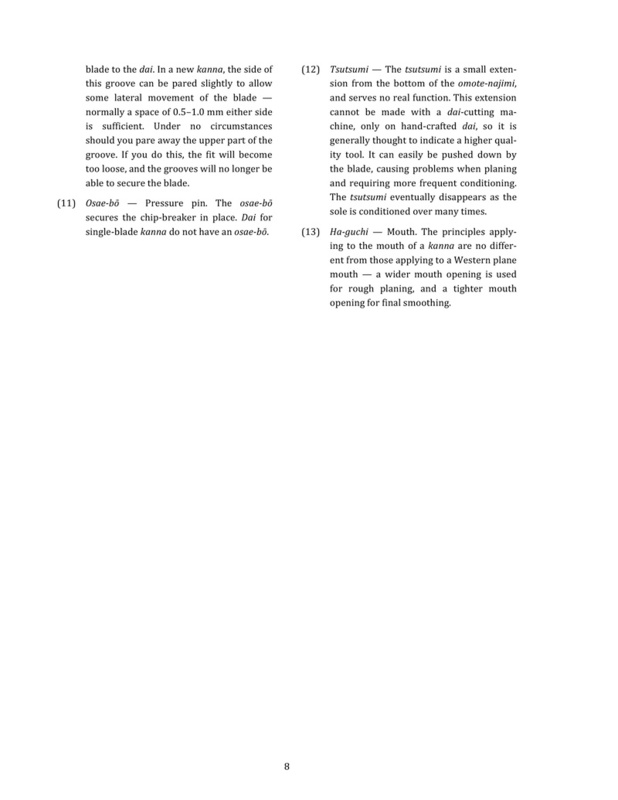 I also cover briefly the process of setting up and tuning the dai in my blog entry here. In the blog entry here I touch on the tapping out (ura-dashi) process. The blog entry here covers how to maintain the appearance of the back of the blade. The names of the different parts of the kanna and blade are shown in the following images. These are extracts from Book 1.